Some couples announced their plan to marry to their social circle through a newspaper personal column or other equivalent of today’s social media. Some held a celebratory party. Others simply started preparing for their wedding with no announcement or celebration. The abiding symbol of an engagement is the engagement ring. Thanks to Percy and Evelyn’s daughter, I have a document that records the purchase of Evelyn’s engagement ring. It is not obvious what “WO/137” and “MH” refer to. I think the signature is Mr Nelson’s, who received payment, presumably from Percy. It seems quite obvious that Nathan Brothers were jewellery manufacturers, but who was Mr Nelson? 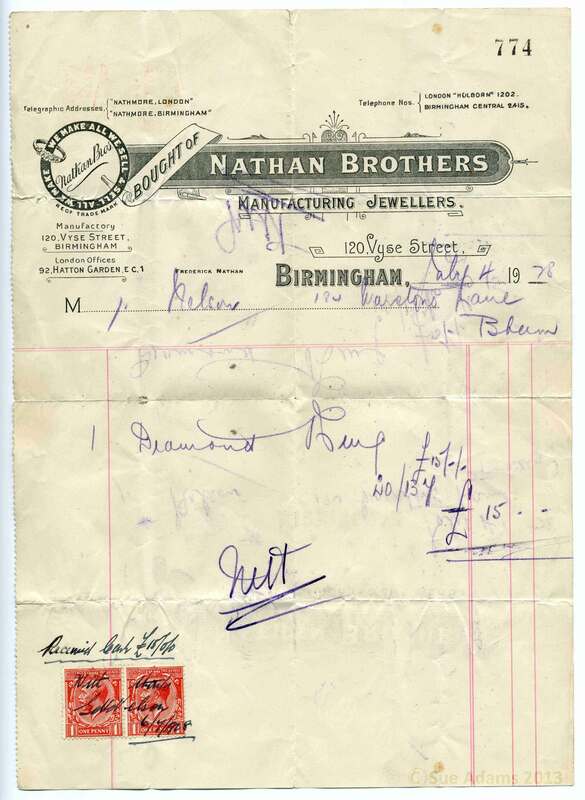 The 1921 and 1932 editions of Kelly’s Directory of Birmingham confirm that Nathan Brothers were jewellery manufacturers based at 120 Vyse Street. I did not find a Mr Nelson, but two businesses operated at the address given, 184 Warstone Lane: Joseph Wainwright, a manufacturing jeweller and Sechaud A. & Co., precious stone dealers. Both Vyse Street and Warstone Lane are in Birmingham’s Jewellery Quarter. The involvement of two businesses might indicate a custom-made ring. I suspect Mr Nelson worked for Sechaud & Co. and that they supplied the diamond for the ring made by Nathan Brothers. From this receipt, we can estimate that the couple became engaged about a year before the marriage. What I do not know is whether Percy bought the ring before or after his proposal of marriage (assuming he did the traditional thing). It would also be nice to add the story of Percy and Evelyn’s courtship, so dear relatives, what tales can you add? Kelly’s Directory of Birmingham, and the counties of Stafford, Warwick and Worcester 1921. Kelly’s Directories Ltd: London. p. 355. digital image. Ancestry (accessed ancestry.co.uk 8 July 2013), UK, Midlands and Various UK Trade Directories 1770-1941. Birmingham. 1921 Kelly’s Directory of Birmingham. image no. 397. Kelly’s Directory of Birmingham, and the counties of Stafford, Warwick and Worcester 1932. Kelly’s Directories Ltd: London. p.441. digital image. Ancestry (accessed ancestry.co.uk 8 July 2013), UK, Midlands and Various UK Trade Directories 1770-1941. Birmingham. 1932 Kelly’s Directory of Birmingham. image no. 506. Kelly’s Directory of Birmingham, and the counties of Stafford, Warwick and Worcester 1921. Kelly’s Directories Ltd: London. p. 358. digital image. Ancestry (accessed ancestry.co.uk 8 July 2013), UK, Midlands and Various UK Trade Directories 1770-1941. Birmingham. 1921 Kelly’s Directory of Birmingham. image no. 400. Kelly’s Directory of Birmingham, and the counties of Stafford, Warwick and Worcester 1932. Kelly’s Directories Ltd: London. p.445. digital image. Ancestry (accessed ancestry.co.uk 8 July 2013), UK, Midlands and Various UK Trade Directories 1770-1941. Birmingham. 1932 Kelly’s Directory of Birmingham. image no. 510. Hello! Just came across this quite randomly. Not sure if I can assist – The ‘Nathan Brothers’ were my Grandfather Rubin Nathan and my Great Uncle, Leonard Nathan. I believe that PATRICIA MCMULLEN is writing a book on marcasite Jewellery and is hoping to include a chapter on Nathan Brothers in her book. This may be totally irrelevant but just thought I would mention it. Thanks for leaving a comment. Can you tell me any more about the Nathan Brothers and their business? I would like to know I am right about the relationship with Mr Nelson. Hi Sue, I have just bought a Suffragette Hallmarked ring dated 1916, BIRMINGHAM , and made by the Nathan Brothers . If you would like to see a photo of the ring , please give me a shout . Hi Steve, Thanks for teling me about your ring by the Nathan Brothers. I’d love to hear how you identified the jewelers who made it. Do you have reciepts of other documents that chart it’s provenance?